Forest fire the morning after. Refined leadership brings forth new life. Our lives are often mired down with things that hinder, entangle and cast a shadow on our leadership. Hebrews 12:1 says, "Therefore, since we are surrounded by such a great cloud of witnesses, let us throw off everything that hinders and the sin that so easily entangles, and let us run with perseverance the race marked out for us." Anything that hinders or entangles us limits our leadership. It may not be evident to all, but it limits our race and limits the life of God flowing from us. The fire of refinement will burn away the old, entangled weeds and dead works causing life to spring forth in our leadership. I think of the forests in the Rocky Mountains of Colorado where I live. Decades of banning fires have caused old trees to cast a shadow over the forest floor keeping new life from emerging. Government ‘fire bans’ effectively preserve old trees and limit rejuvenation of the forest. 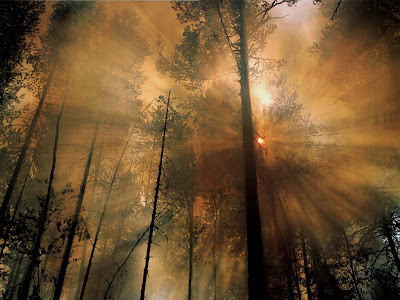 However, as soon as a fire burns through the forest, sunlight finds its way to the forest floor and new trees, shrubs, and flowers spring forth immediately. It’s an awesome thing to behold as the fire burns away the old and brings forth life abundantly. Leaders must be careful not to cast a shadow over the life of their ministry by banning the fire of the Spirit. Let it burn. Your leadership and your ministry will bring forth new life!